Look, I'm not gonna lie: I did not have high expectations for Justice League: Earth's Final Defense. I joked with co-worker Mike Fahey that the subtitle makes it sound like the World's Greatest Superheroes would lose their fight. Little did I know how right that joke would prove. The iOS game developed by Chinese net studio got a stealth announcement during Comic-Con. That was Red Flag #1 that it was going to be bad. But from what I saw in the trailer, it looked like at the very worst Earth's Final Defense would be a mindless beat-em-up. Ok, I could deal with that if I got some fun fan service. 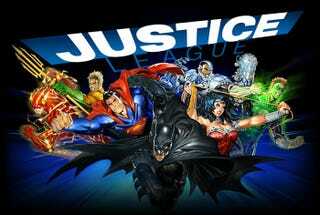 There's nothing fun about this Justice League game. At all. Sorry, I got bored just typing all that. Fell asleep. Listen: I choked down the initial chunk of Earth's Final Defense so you wouldn't have to. It represents everything bad about cash-grab licensed property games. It feels like it was made by people who slapped on Batman and Wonder Woman's costumes on plain-jane character models, in lieu of trying to figure out how to get across what's great about these iconic characters. Worse yet, NetMarble couldn't even follow the example of NetherRealm, who made a shallow but fun-in-a-guilty-pleasure-kind-of-way effort with the Batman: Arkham City Lockdown mobile game. Hell, even Gameloft's Dark Knight Rises tie-in game looks like award-winning material next to this tripe. In an era where Rocksteady's Batman games stand out as the cream of the superhero video gaming and the promising Injustice: Gods Among Us looks like it'll be a great mix of fan service and approachable gameplay, the powers that be at DC Entertainment simply shouldn't be letting experiences like this off the runway. Whatever profits are to be had from this game aren't worth the damage it does to likenesses of the characters contained therein.